A couple of hours on the bus and I found myself on the very brief 1 day stop at Brisbane where I met back up with Vanessa. Being that I literally had 1 day in the city, it didn’t give me a lot of time to play with, I essentially had to pick one worth while activity to do while I was there, and Vanessa found it. The hostel itself was nothing to shout about, being as I had attended a couple by now I finally felt I had a grasp of what a “good” hostel should be like. 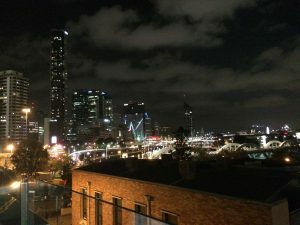 However there was one aspect of the hostel that did make it special, and that was the view it provided from the smoking area right on the top floor, which overlooked the entire city which looked spectacular during the day and absolutely outstanding at night. I arrived in Brisbane at 2pm, meaning we needed a plan quick before we wasted the day. With Vanessa already having spent a couple of days she was a bit more aware of what there was to do in the area. 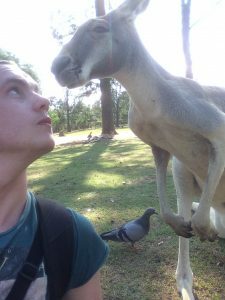 She suggested a visiting the Lone Pine Koala Sanctuary. The question didn’t even need an answer. Another question that the travel agent asked was “would you like a picture with the koala?” Again, this didn’t need to be answered. We walked into town bitterly reminded that Christmas was approaching while passing the various Christmas decorations, which look ridiculously out of place when I’m roasting in 25C+ heat desperately trying to find shade. We paid for our bus tickets (with a $50 note which gave me all the change in coins) and travelled out of Brisbane to the sanctuary. This day has to be considered one of the biggest highlights of my trip so far, it was outstanding! It didn’t feel like a zoo at all, despite there being various enclosures of every Australian animal you could think of. Walking round and seeing the multiple enclosures lacking a chain-linked fence with koala’s everywhere, every single one looking cuter than the next. Even having a specific “baby koala” section which my heart simply exploded with the cuteness. Naturally I had to have the opportunity to hold one which was just as amazing as I thought it would be. He felt exactly like a heavy teddy bear gently putting his arm on my chest and curiously poking his nose towards mine and with his unbelievably soft fur, I didn’t want to let him go! There was another bonus to be found at this sanctuary, something I had no idea at the time was possible. 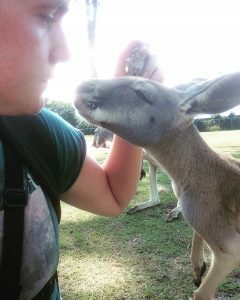 It was an opportunity to feed kangaroo’s. I assumed this would be something like grabbing a handful of food under the supervision of a humourless guard while reaching through a designated area on a cage where they would all congregate. I couldn’t of been more wrong. 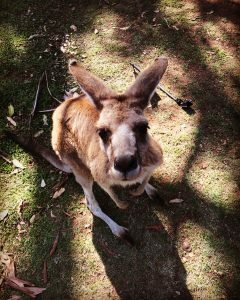 Armed with two bags of food I’d walk up to a kangaroo who kept laying there, careless at the fact I was in its space. With a handful of what looked like rabbit food, I’d gently wave it infront of them and watch as they came up to investigate and ever so gently nibble out of my hand. Every single one of them were incredibly friendly, to the point where I’d even made some new friends, Natasha and Richard (also known as Lil’ Rick to his friends) who I spent a considerable amount of time in their company. I just sat on the ground with the two of them as they were directly beside me, nose to nose. The more time I spent with them the more comfortable they got, with the little one (Lil’ Rick) climbing over me to get more food. I easily could of spent my entire day there with them. On the second day, we’d be leaving in a few hours, so no time for any considerable activity. 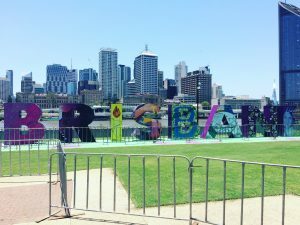 My only plan of action was to visit one of the most well known spots I suppose of Brisbane, which is photographed anytime anyone visits there, which are the giant “Brisbane” letters on the South Bank for my gratuitous tourist shot. How else would people of known I was in Brisbane? Next stop, Rainbow beach and of course, Fraser Island. Time for a real adventure. Llynia da iawn.mi wyt ti i weld yn mwynhau.